Andy Brown, the third generation in a family of pilots, was excited. 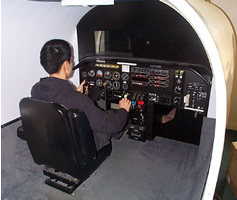 This was his first test in a flight simulator in which he was to be co-pilot of a commercial airliner. He felt good about himself, because unlike his father and grandfather, he had gone to schools which had practiced the most modern principles of education. The simulated take-off from Chicago was routine until the simulated chief pilot suddenly "died" of a heart attack. Andy immediately called the nearest flight center, and they advised him to return to Chicago rather than proceed to Denver, the planned destination. Andy thought about it for a minute and then became angry. Who were they to tell him what to do? He had been taught since the first grade to defy any authority figures, including his parents, who tried to "limit" his freedom of expression. He decided to keep going. He proceeded to plot the course to Denver, but he was forced to do it by hand, because the computer had a simulated malfunction. At this point he started to feel a little uneasy; he had been educated with "fuzzy math," which gave full credit for wrong answers if you seemed to have followed the "right method." Computation, of course was passé, but he tried to figure it out "approximately." He did not worry about exactitude, because every teacher he had ever had in school and college had assured him that "you cannot be certain of anything." Soon the plane entered a simulated storm system, and Andy was now forced to fly solely by instruments. This was getting difficult, and Andy started to feel resentment. After all, in school he had never been held to absolute standards. If he failed a test, he was always allowed to take it over until he got a good grade. This was so that his self-esteem would not be threatened. He looked down at his instruments but started to feel confused. One of the instruments was labeled "attitude" and another "altitude." He always had trouble distinguishing similar words, because he had been trained to read by the whole word method rather than by phonics. The teachers were happy if he got the "general idea" of what a word was. Spelling, of course, was also passé. At this point Andy felt the need for reassurance. He had always worked in groups at school. In many courses, groups even took the exams as a unit. He had never been held individually responsible for anything. If there was a problem, it was someone else's job to fix it. But there was no one in the plane to consult -- only 250 simulated passengers whose "lives" depended on his skill and judgment. In desperation Andy called a control center, but simulated static from the storm made a good connection impossible. He pulled out the flight manuals for help, but they were very long and looked terribly complicated. He had not really studied them as he was supposed to. In school, he never had to actually read a textbook. Class periods and exams often consisted of the students expressing their feelings about the teachers' feelings about the material. Besides, some of the words in the manuals were long, and he had not seen them before. Andy's carefully cultivated illusion of "self-esteem" -- based on a lifetime of having met no standards, having acquired no knowledge, and having answered no questions requiring an objectively correct answer -- began to crumble when confronted by an inexorable -- even if simulated -- reality that could not be faked. The realization slowly hit him that his self-esteem was a sham and that, in fact, he was unfit to function in the real world. Tears began to stream down his face, and he was still crying 10 minutes later when the plane "crashed" into a mountain peak -- 100 miles south of Denver. Andy had "mastered" the core principles of modern education too well. His father and grandfather had been educated the old-fashioned way. They respected their teachers, because their teachers taught them something: they taught them to read using phonics; they taught them facts and how to think using facts. The teachers had standards (including the use of proper spelling, grammar and punctuation), and the students had to meet these standards. There was a right answer to every math problem, and you had better figure it out -- on your own, and you had better be sure, and it didn't matter how you felt. No, this is not a true story and Andy would not get a job with the airlines -- today. But our society is rapidly being populated with Andy Browns. The modern educators' chickens are coming home to roost. If they become dominant in our society it will perish just like Andy's 250 simulated passengers -- only the crash this time will be real.